Rusty Richards was pitching that night, his second major league start, in Houston for the visiting Braves. But it might as well have been a home game for the right-hander. Richards grew up in Houston. Everyone he knew, or so it seemed, was there. "I had 32 passes and I'm sure there were a lot more (friends) here," Richards told The Associated Press. All those friends, however, didn't see a good outing from their hometown pitcher. He went just four innings and gave up three runs. But, what no one knew at the time, was that that night, they saw Richards pass the halfway point in a major league career that spanned just three games. Richards made the majors that September after four seasons in the minors. He began in 1986, taken that January in the seventh round of the draft. He played that first year at the rookie Gulf Coast League Braves. In 1987, he hit single-A Sumter and single-A Durham, going 9-13 between them, with an ERA of 4.16. At Sumter, in May 1987, Richards threw seven innings, giving up two runs, but got the loss. Richards was 3-3 with a 3.19 ERA before being sent to Durham. 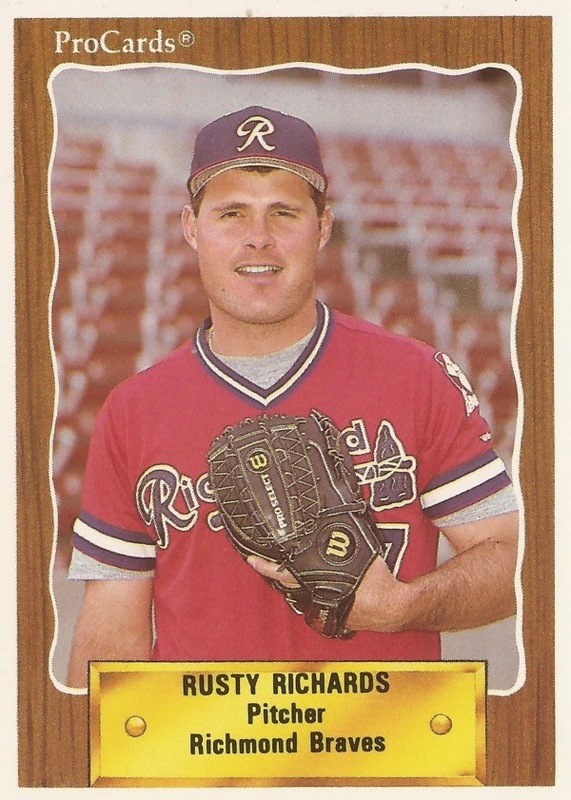 Richards made AA Greenville in 1988 and then AAA Richmond in 1989. At Richmond, Richards was 11-11 with a 3.81 ERA. He got his first call-up to Atlanta that September, making his debut against the Astros in Atlanta. In his debut, Richards went 5.1 innings, giving up five hits and two runs. His braves were up 6-2 when he left. That soon turned into a 7-6 loss, depriving Richards of his first win, something he would never get. That Richards and other rookie Braves were even playing in games that had an impact on the pennant race, had some upset, including Padres manager Jack McKeon. But Richards got his two starts and it was back to Richmond for 1990. But he got his call back on July 1. It was a brief call-back. Richards got into only one game and one inning on this final trip to the majors. On July 6, Richards pitched the ninth, the Braves down 7-3. When he was done, it was 10-3. Richards finished out the year at Richmond. He returned briefly to Richmond for 1991, but then was off to the Twins system, playing at AA Orlando. It was Orlando again for 1992, going 4-7 with a 5.12 ERA, ending his professional career. Back in that second major league game, at the Astrodome, Richards started off the game with a walk and a Craig Biggio two-run home run. Richards was hard on himself later, speaking to The AP. "The pitch to Biggio was a fast ball with no juice on it," Richards told The AP. "I haven't pitched to my capabilities up here but I'm trying to throw strikes."